I live in California and, as such, I’m generally less shocked by human behavior than people who live in, say, Oregon or Montana or Arizona. California is a weird place and people feel fully entitled to express themselves as they see fit…. which is a good thing. For all the strangeness I’ve seen down here, one of the funniest ones is this guy who I call The Mad Printer. The Mad Printer was discovered at Lion’s Coffee in Mission Valley. He started out like any other web surfer in a coffeeshop. He was posted up by the window with his laptop, quietly perusing the intarwebz, minding his own business. He was there for about 45 minutes before he disappeared to his car and returned with a large printer box. He proceeded to remove from this box a color inkjet printer and paper. He sets up the printer on a chair next to, plugs it in, loads some paper, and starts printing out email from Yahoo (not that I was looking at his screen or anything). 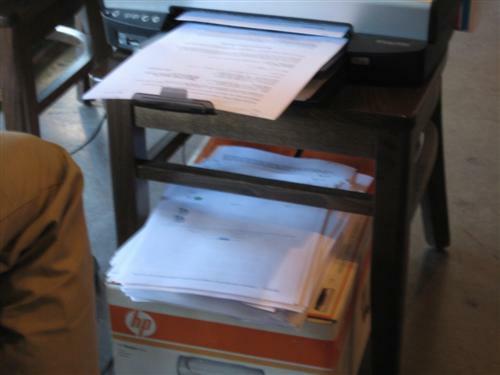 Coming to a coffeeshop with the intent to print things is, in my opinion, simply odd to begin with. Are there not better places to go? Aren’t you a bit embarrassed to have that complex of a set-up in a public place? Aren’t you scared someone is going to kick out a plug or bump into it? 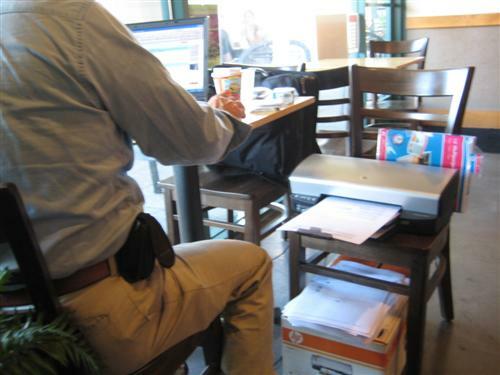 Not this guy, he was merrily printing away. After I got over how silly this seemed, I went about my business writing a few blog posts. After another half-hour, however, I realized that this printer had been going full-bore that whole time and he had racked up a formidable stack of printed paper. This began to distract me as I wondered just how long it would continue. In the end, this thing was printing continually for over an hour. At an average of about 20 pages per minute (guess), that’s over 1,200 pages of printed material… all from this guy’s email account. Part-way through, he abandoned his set-up to walk across the parking lot to the Staples and buy another ream of paper. The environmentalist in me was furious, the financial advisor in me was dumb-founded, and the hater in me though this guy was out of his mind so I took pics and here they are. Check out a Print Preview before you fire up your printer. More often than not, there are pages at the beginning or end of your document that you can choose to not print. Watch out for blog posts in particular; sometimes you end up with page after page of comments you weren’t going to read in the first place. Try copying the text you want to read and pasting it into a word processor. Adjust the text size down if you can, remove images you don’t need, and shrink the margins. I’ve cut document sizes in half or more using this method which is a good thing to do if you’re talking about 10 pages or more. After you’ve chosen the Print option, click the Properties button and print two pages per sheet. This cuts the document and print time in half. If your printer is capable, also print on the front and back; this will also halve the number of sheets of paper you’re using. Don’t be a Mad Printer. Print Smart.